At the end of January, I’ll be participating in my first big tournament at Coastal Assault. This is big step out of my comfort zone as I usually just play pick-up games and Apocalypse. However, over the last few weeks with Jerry and I play testing new units and codices, I’ve decided to give it a try. I also want to see how good of a player I am having only really played Jerry. I’m not going to build myself up with the idea that I’ll win, or that I must win. 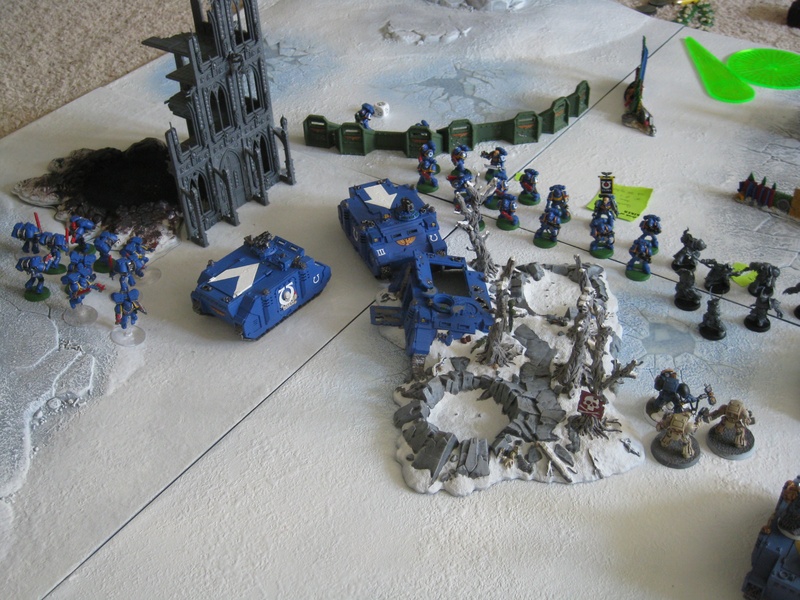 I just want to go have a good time playing other people and other armies. Having said that, I don’t want to be a push over. I do want to put up some kind of fight, and at least win a game or two, which is why I posted my list. Thoughts, suggestions, and criticism is welcomed. 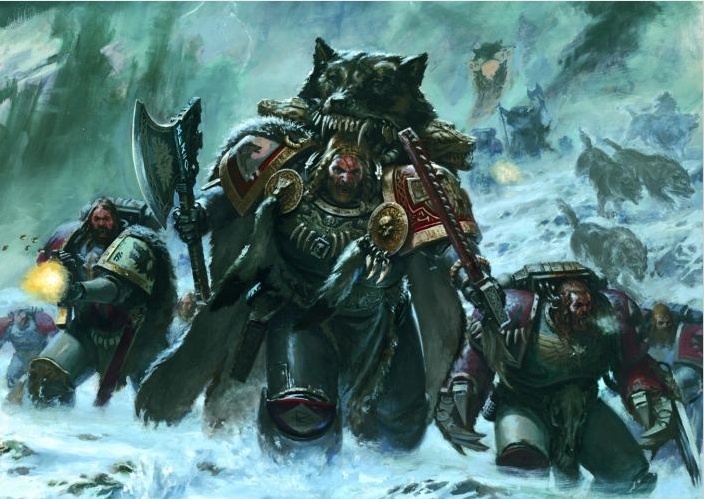 I’ve been playing Space Wolves since they came out recently, so I’m very familiar with what is good. I think the tactics of my list are straight forward. I put my Rune Priest in with a pack of Grey Hunters and drive them around sniping psychic powers, denying psychic attacks, and just try to keep them fresh as long as possible. My other Grey Hunters will do much the same, but specifically target troop choices and try to claim objectives. 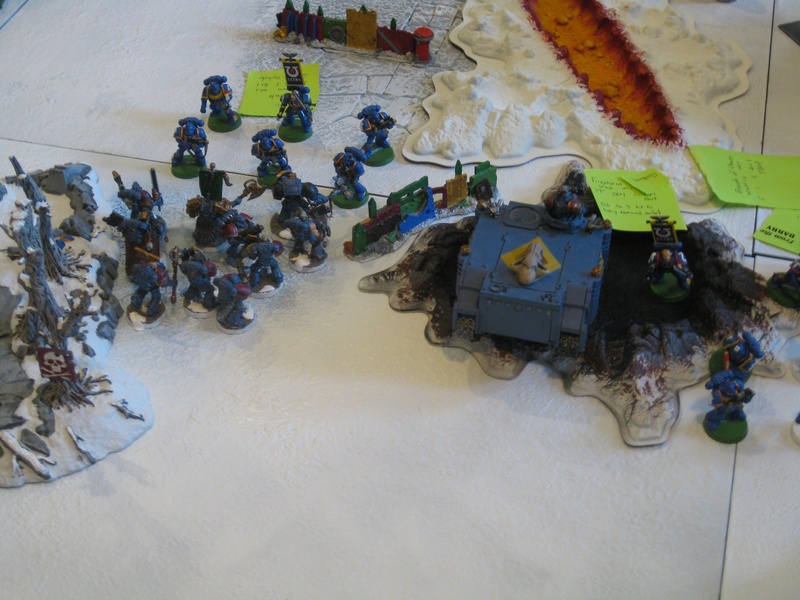 My Wolf Guard with Arjac are going after higher priority targets like Special Characters and HQ choices. I’m also using them to counter any Terminators that I might encounter. The Long Fangs will be tucked behind the Aegis Defense Line with a Wolf Guard pack leader in Terminator Armor and Cyclone missiles. Finally, my Razorback will support either the Grey Hunters or the Wolf Guard. I only have a few problems with this list. First, the mobility of my Wolf Guard. Without a Land Raider, I can’t get them to where I may need them in a hurry, or conversely, get them out of a situation I don’t want them in. I’m still leery of Long Fangs. I’ve never really had good results with them. However to be fair, I’ve never loaded my whole Heavy Support chose with them. Finally, I lack things like Heavy Bolters, Autocannons, Assault Cannons, and template weapons in case I go up against any horde army. Over the next couple of months, I’ll begin training and seeing how this works with the tournament missions. I have no doubt that I’ll be making some changes. It’s been a few weeks since I last updated about this post. That’s because things have slowed down since I’m working on the tower, and to be honest, I’ve also been distracted with the new Chaos Space Marines codex and the Horus Heresy book. 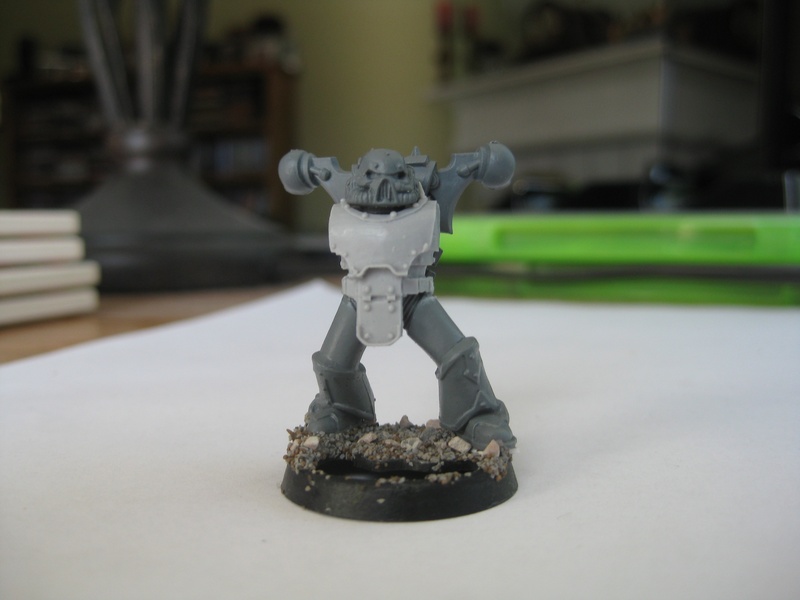 I’ve been tinkering around with bits seeing what I could make, and painting test models for various paint schemes. I did take the time to get a large part of the tower done along with the floor, and so I figured I’d post an update and guide. To begin with, this is the method I’ve used for all the floor piece for the Fortress of Redemption. 1. 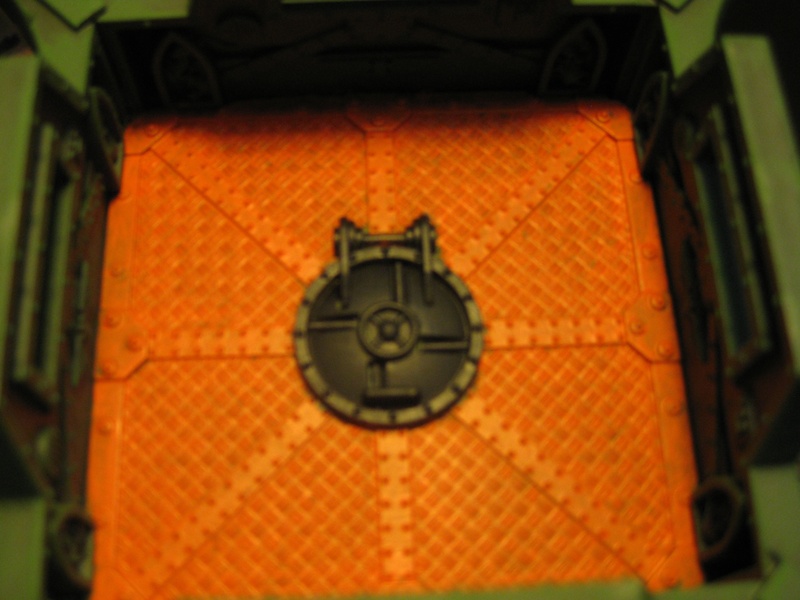 Major floor parts are done with Blazing Orange. 2. Parts that will be metal are painted black. In this case the hatch. Finally, the hatch is painted with Boltgun Metal and washed with Vallejo Sepia Shade. 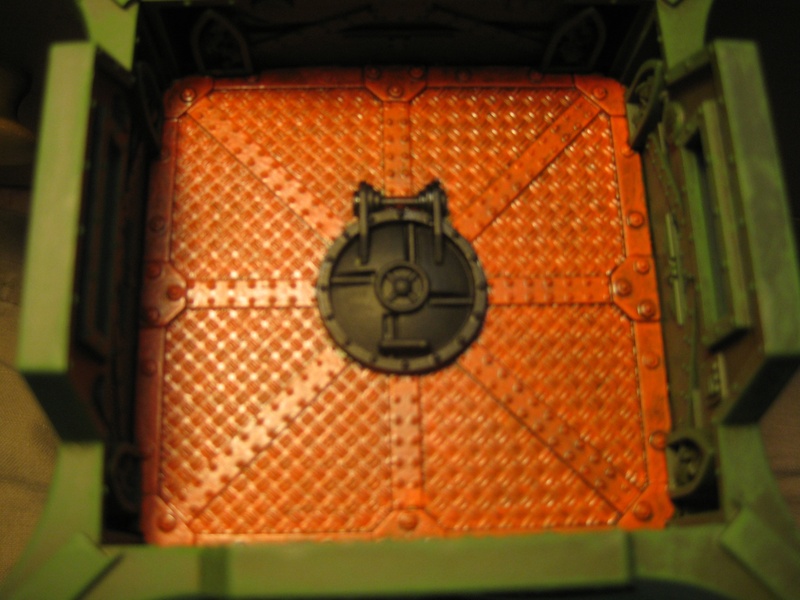 A light dry brush of Boltgun Metal is also applied to the floor. The front of the tower posed a very unique challenge. I’m sure there are people out there with the air brush skills to do most of the painting with an air brush. I, however, do not have those skills, so all of the tower is painted by hand. I can say that after everything is done I’ll need to go back over and do some clean up work. Cloak was painted using Vallejo Light Grey. Wings were painted using DecoArth Colonial Blue. Halo and sword hilt was painted Scorched Brown. Rock was painted using Vallejo Deep Blue Grey. 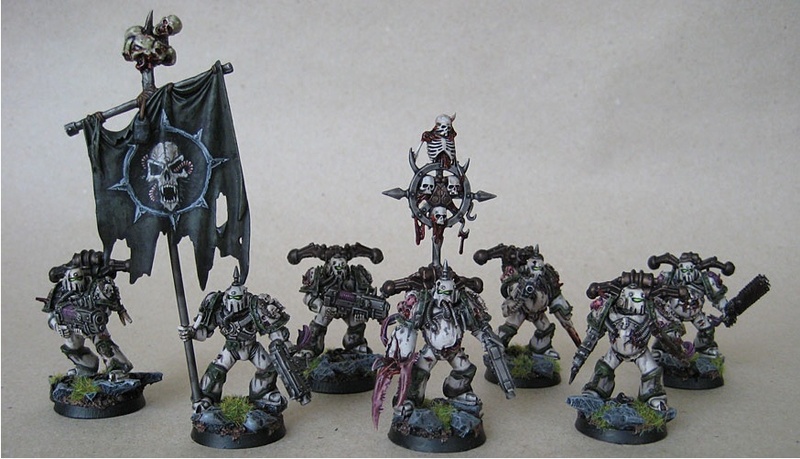 Bones and scroll were painted with Kommando Khaki. That part alone took almost a week, and you can probably see that I haven’t even touched the bottom half of the tower. 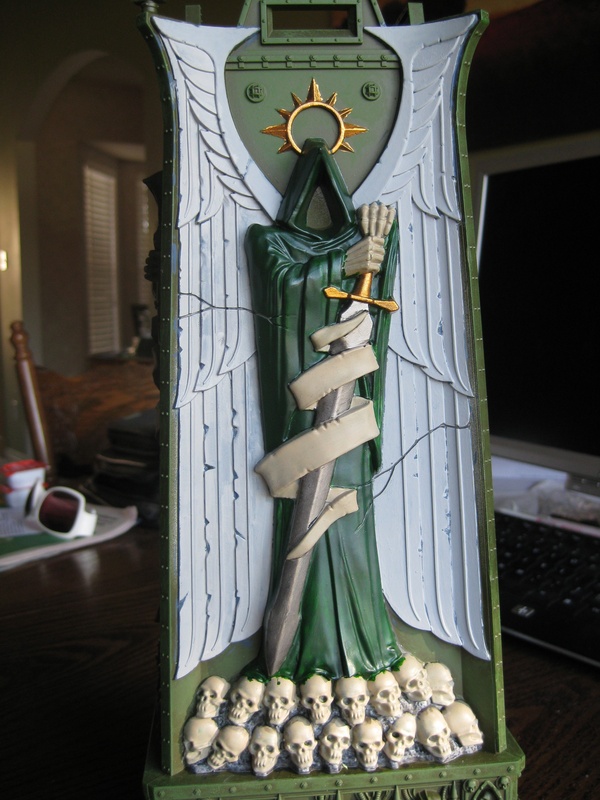 Cloak was painted using Dark Angel Green. Wings were painted using Fortress Grey trying to leave a little of the Colonial Blue still visible. Halo and sword hilt were painted using Shinning Gold. Sword was painted using Boltgun Metal. 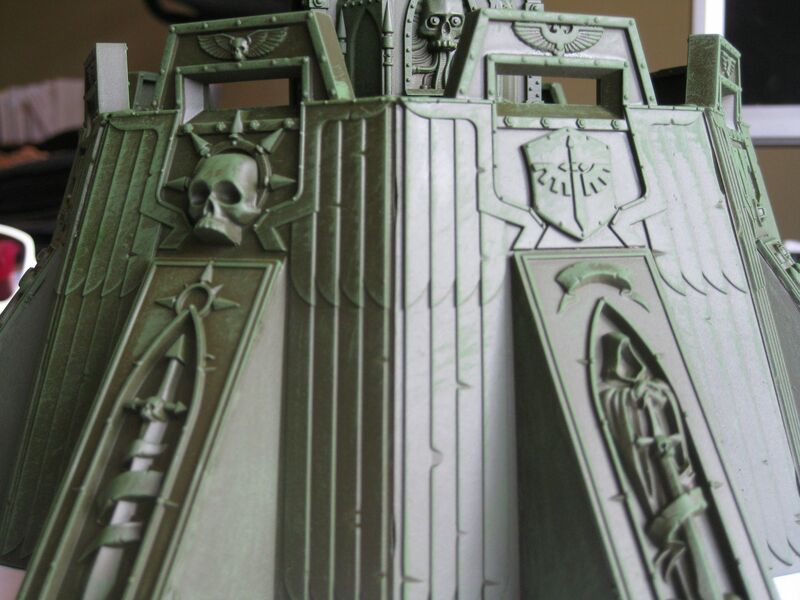 Rock was dry brushed using Fortress Grey and Skull White. This process took another week and a half, so it was about halfway through this step that I took a break. You can clearly see in this picture where I’ll need to go back and do some clean up work. That’s where I stand now with the Fortress of Redemption. The discouraging thing is that this is only one of the four panels that make up the tower. It throws into light how long it’s going to take me to do this. I’m not dumb enough to set a ridiculous goal of when this thing will get done, but I would like to try to have it done be the end of January. Check back for more updates. 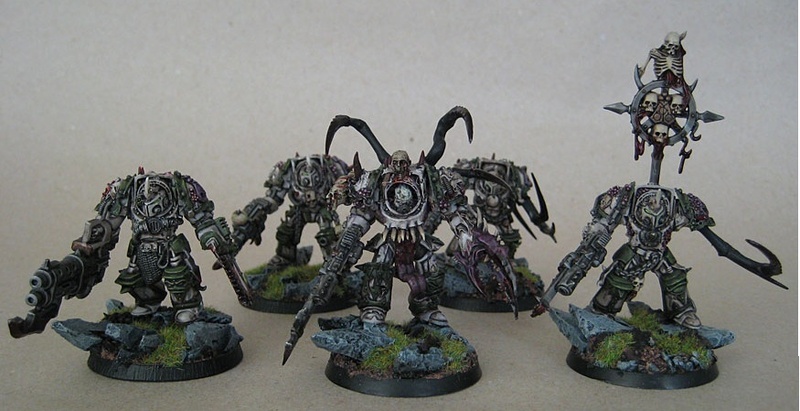 These will not be Plague Marines but simply Chaos Space Marines. As it stands, I can really go either way. 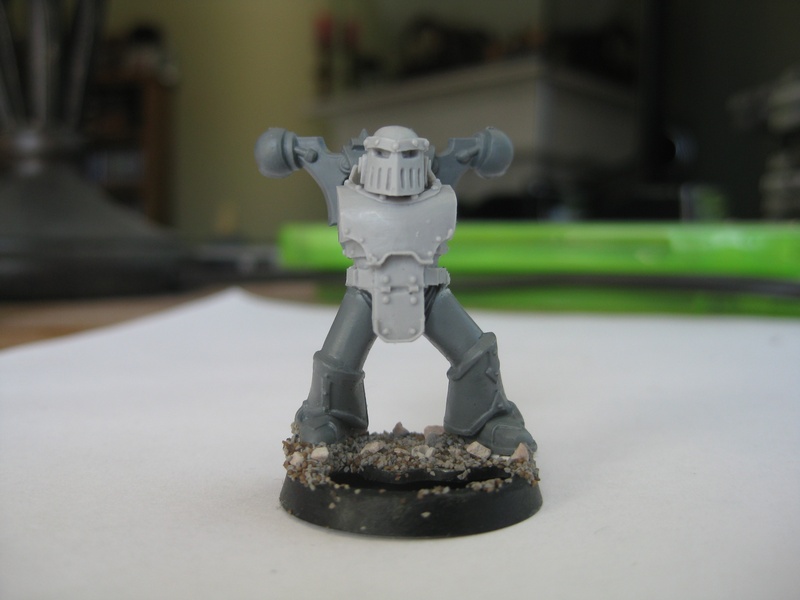 As for shoulder pads, I’ll probably use a combination of the Death Guard Havoc shoulder pads and the Mk III shoulder pads. Any opinions would be welcomed. It’s been a busy week for the site, and Chaos fans. 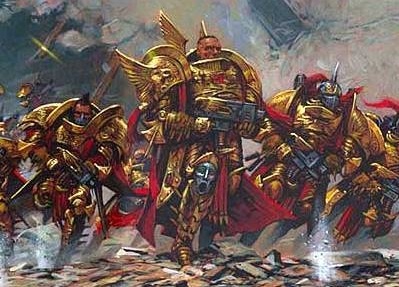 I broke down and got the Chaos Space Marines codex yesterday, and I figure I would go through and give my opinions on it. Keep in mind that this is in no way and exhaustive review of each unit and piece of war gear nor is this review given with a competitive mind-set. 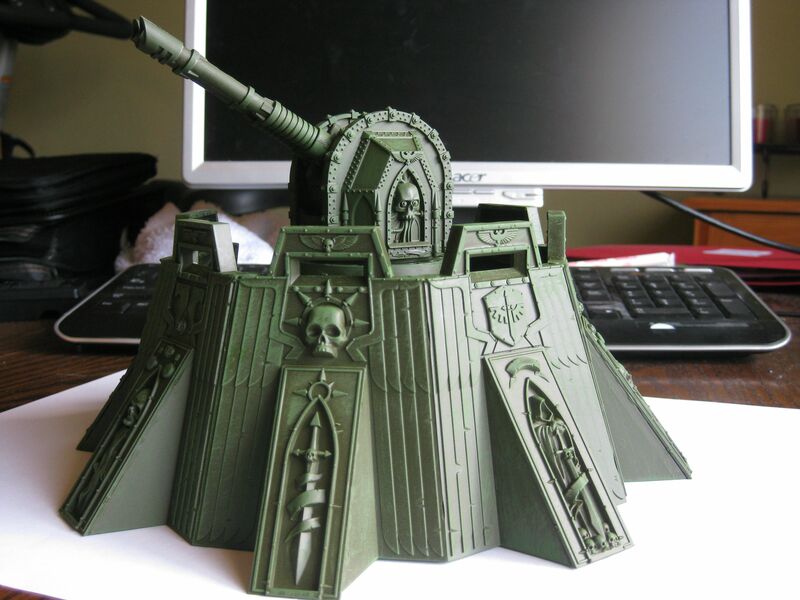 To put it simply, these are my thoughts on what I would take if I played Chaos Marines. For the sake of time, both for me writing and you reading, I’m only going to go over HQ and Troop choices in this post. I’ll follow-up tomorrow with Elites and Fast Attack choices. So without further ado, let’s jump in. 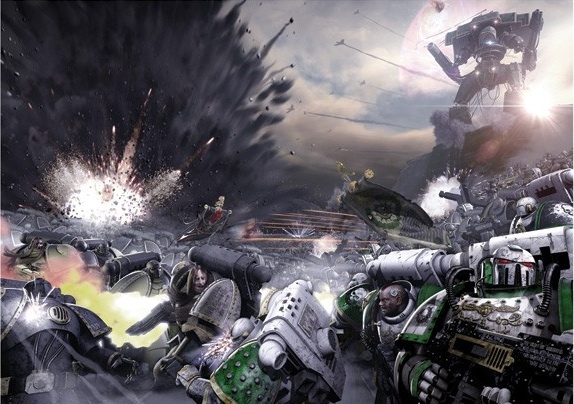 To start off with, my general impression of the codex is that there is a bit of a push to construct themed armies, which I am all for as this was one of the biggest detractors for me with past Chaos Marine codecs. Depending on what mark of chaos you take will limit you certain pieces of war gear and options. Speaking of marks of chaos, there are special rules: mark of Nurgle gets +1 Toughness, mark of Khorne give the Rage and Counter-Attack special rule, mark of Slaanesh get a +1 to Initiative, and mark of Tzeentch get a +1 invulnerable save giving models that don’t have a cover save a 6+ invulnerable save. 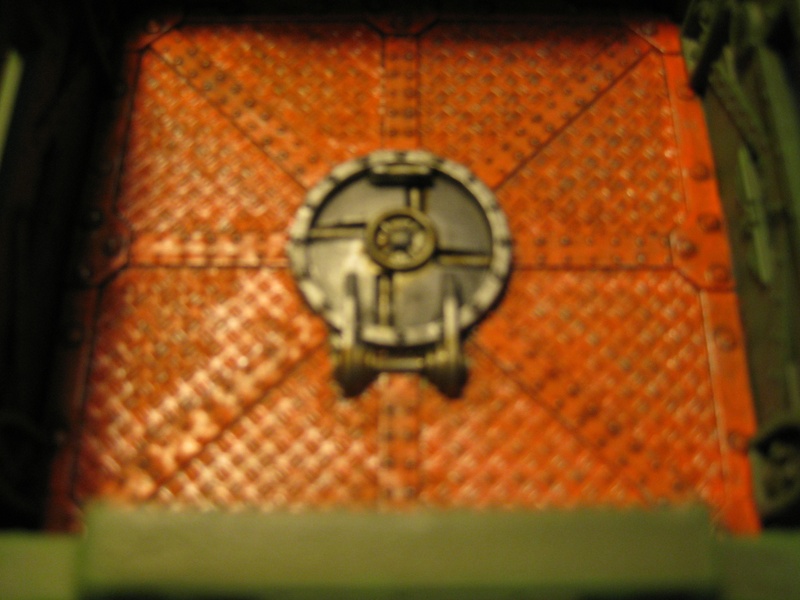 Just about every unit in the codex can take one of these marks. To supplement the marks of chaos, a unit can also take one at five possible icons: Icon of Wrath, Icon of Flame, Icon of Despair, Icon of Excess, and Icon of Vengeance. The icons only add a certain universal special rule like Fear, Furious Charge, etc. Depending on what mark of chaos a unit takes will limit the unit to only two icons; the icon that corresponds to the mark, or the generic icon, Icon of Vengeance. It’s the mixing of the mark of chaos, icon, and unit that a player can create some very fun special units, and again is a little push towards making a themed army. 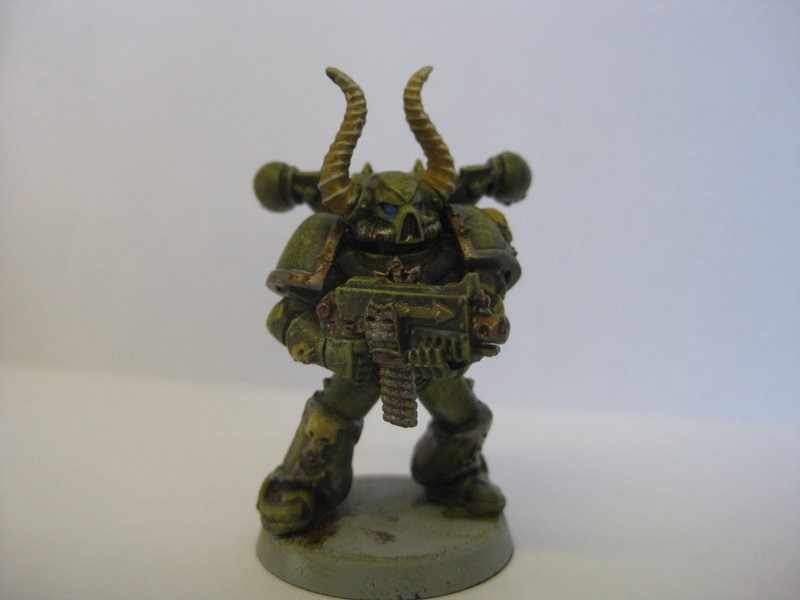 Since I’m partial to Death Guard, I would probably out fit most units with mark of Nurgle and give them the corresponding icon. All of the special characters are not very expensive with only Abaddon, Ahriman, and Typhus coming in over 200 points, and each of the special characters, except two, changes an elite choice to a troop choice. 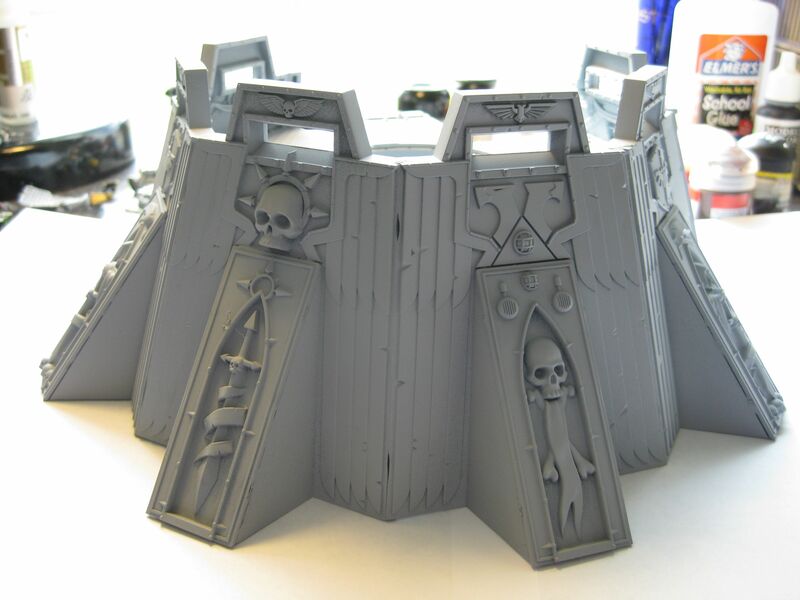 However, the HQ choice that I’m most interested in is the Chaos Lord. He’s only 65 points. You can outfit him anyway you want, and if given a mark of Nurgle, Khorne, or Slaanesh, the player can take the corresponding elite units as troop choices. The Sorcerer is also another great choice. He’s only 60 points, and can be outfitted similar to the Chaos Lord. 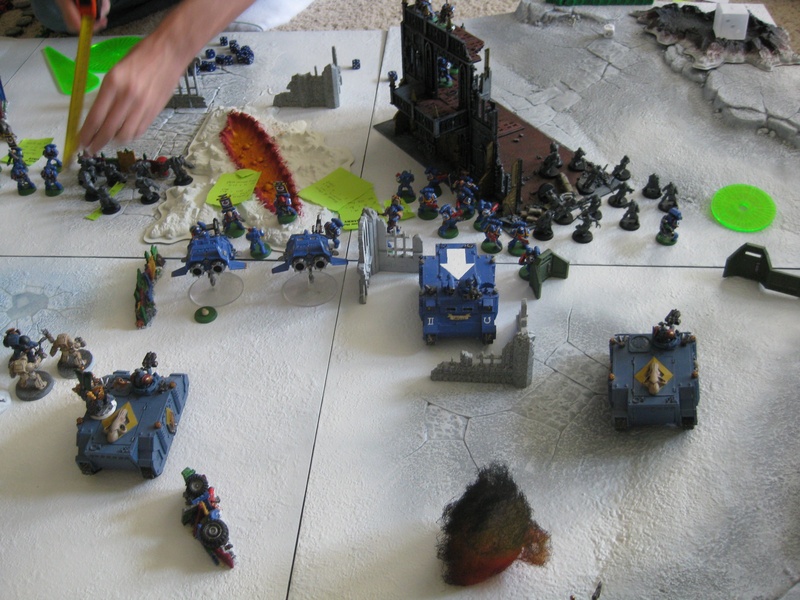 If given the mark Tzeentch, then Thousand Suns can be taken as troop choices. I do want take this moment to mention the Chaos psychic powers. Much like the icons, a Sorcerer with the mark of Tzeentch, Nurgle, or Slaanesh will only be able to take the powers from their respected Chaos god. However, the universal psychic powers of Biomancy, Pyromancy, and Telepathy are still available. 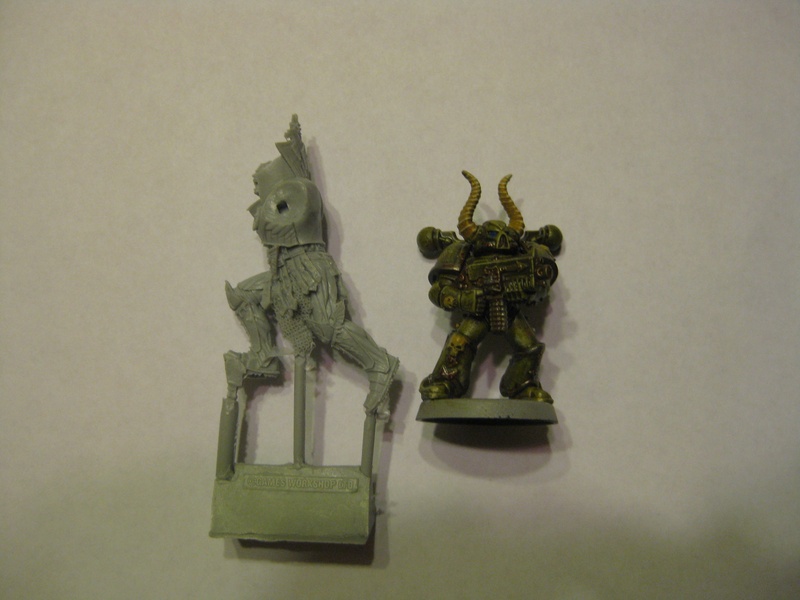 Besides those two, there is the Daemon Prince, Warpsmith, and Dark Apostle that are also HQ choices. These units I probably wouldn’t really deal with. The Daemon Prince is 145 points with no armor save. I would have to spend 20 points to give him power armor plus any mark of Chaos plus psychic mastery levels plus any weapons. As you can see, a Daemon Prince will add up quickly. 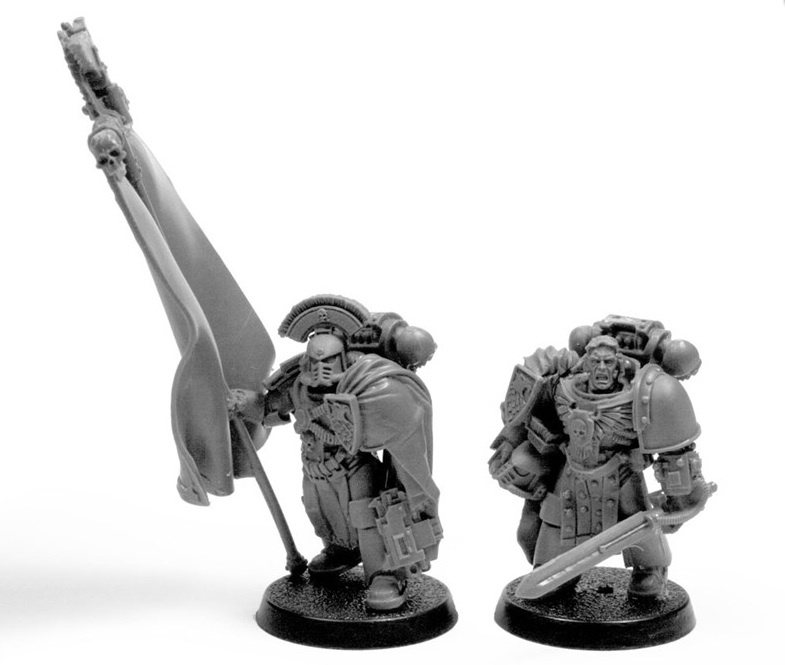 The Warpsmith and Dark Apostle are basically Chaos versions of a Techmarine and a Chaplin, and given what a Chaos Lord or Sorcerer can do I haven’t even really looked at them. 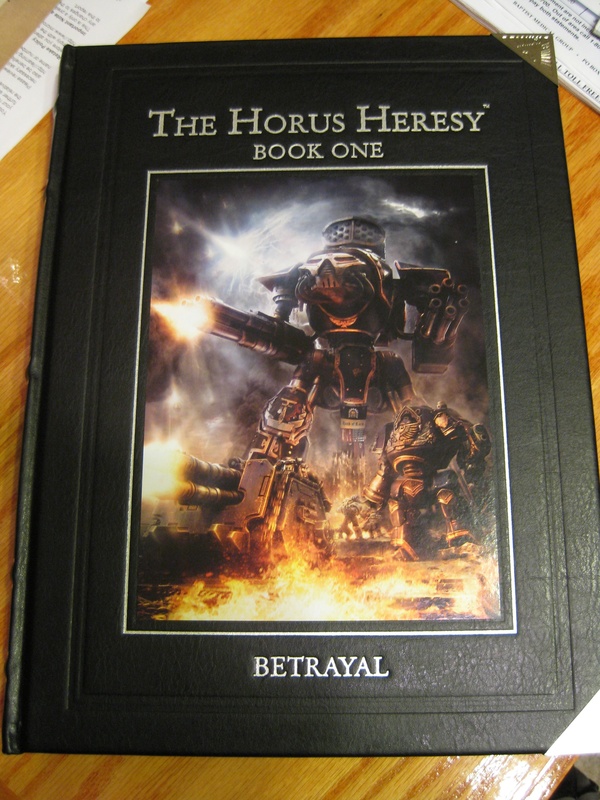 The Chaos Marines only have two choices for troops: Chaos Space Marines and Chaos Cultists. The nice thing about these two units is that you can have a lot of them. 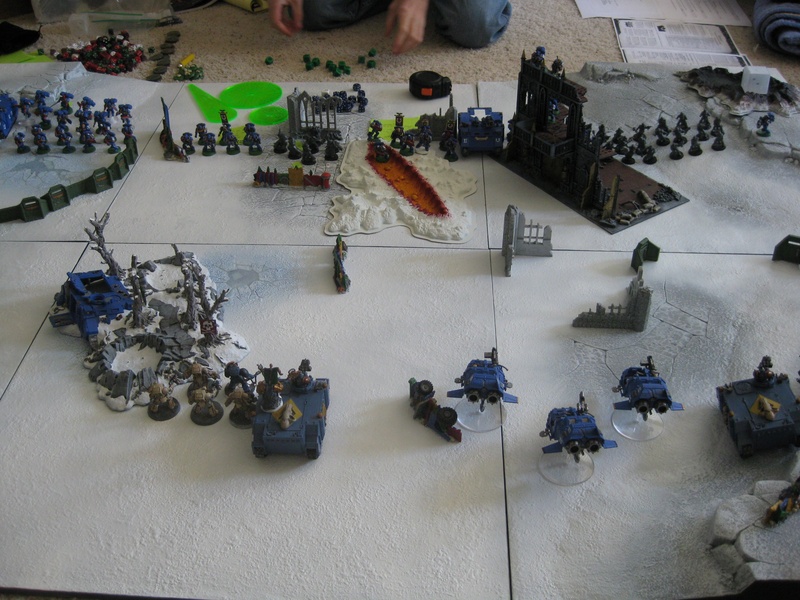 You can have up to 20 Chaos Space Marines and up to 35 cultists. 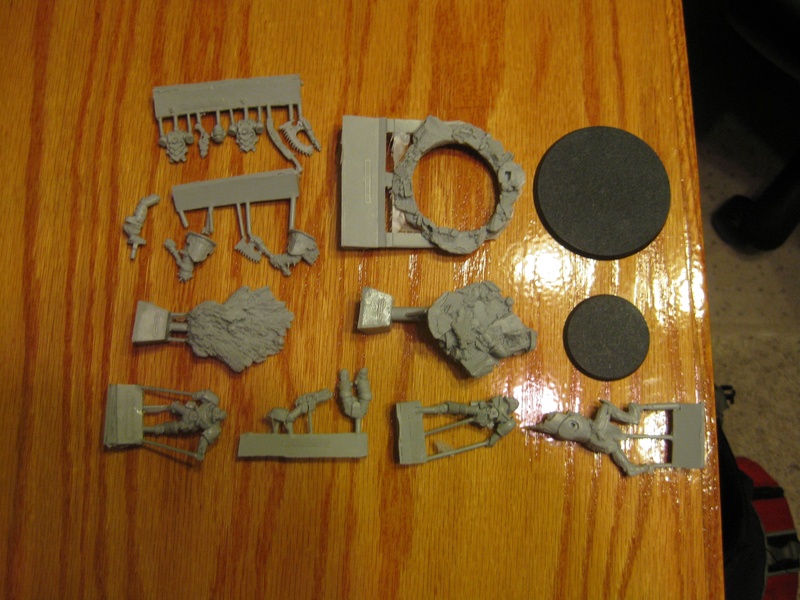 The options for the Chaos marines is more extensive than for the cultists. 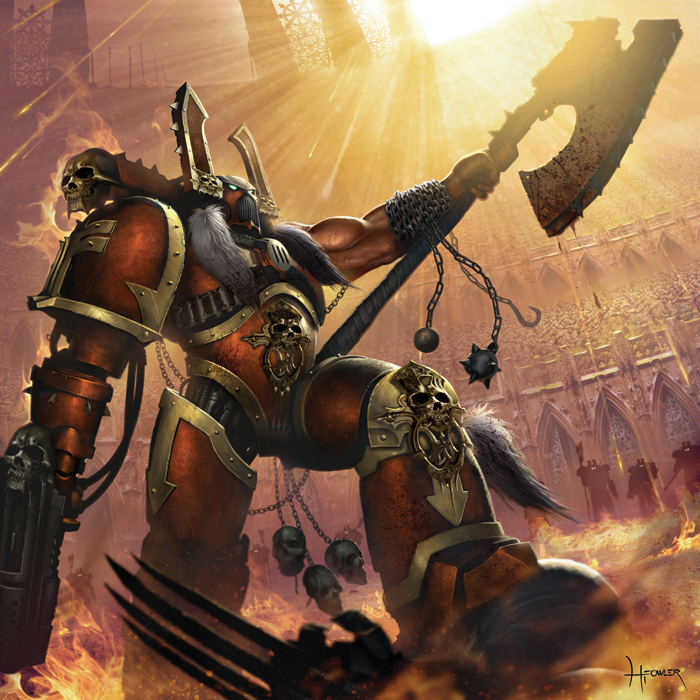 All Chaos Marines can get a close combat weapon on top of their Bolt gun and Bolt pistol. If they number 10 or more, they can have two special weapons or a special weapon and heavy weapon for the cost of the weapons. The sergeant can be outfitted pretty much however you want with ranged weapons and melee weapons. He can be given mutations, but the mutations are randomly rolled for on the Chaos Boon table. Naturally they can be given a mark of Chaos and icon. The cultists are basically renegade guard. They start out as a kind of close combat squad with pistol and close combat weapon. They can be given autoguns for one point a model. Finally, they can be given a mark of Chaos and an icon. The only interesting thing about these guys is if you take a Chaos Lord with the mark of Nurgle. In which case, all cultists become zombies. Can we all scream ZOMBIE APOCALYPSE! As promised, I’m not going to go over everything in great detail, nor am I going to go over what unit build is cost-effective and competitive. I’m just simply putting down what I see. This codex seems like if would be very fun to play with particularly if you take a Nurgle lord and have zombies. The nice thing about the codex is that it has the options and makes it easy to have a themed army, which is a big selling point for me. 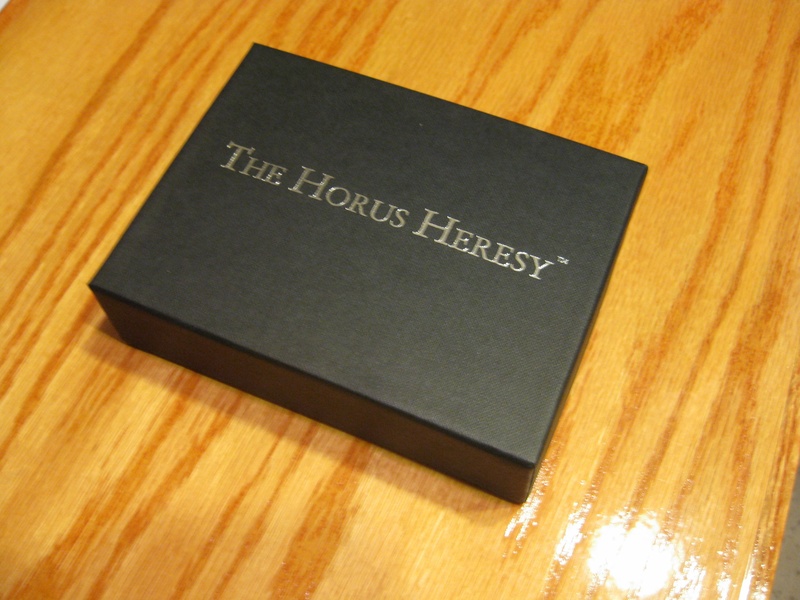 I’ll be play testing the codex this weekend, so I should have a much better picture to paint of the codex after then. Until then, let me know what you think and your opinions. The other week I posted the first part of my Fortress of Redemption build. After a quick trip to Atlanta and weather cooperating, I was able to begin to paint it. 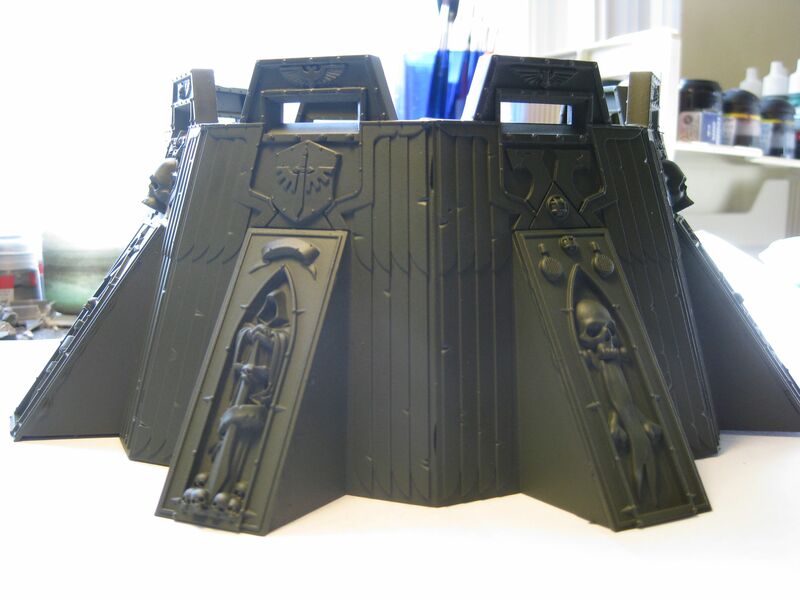 This post is both a project update as well as a tutorial on how I am painting my fortress. I don’t use Games-Workshop paints very much anymore, but I will post color equivalence as I go along. Before we begin, I’m breaking this tutorial into parts. One because the project is so large and very time-consuming, but also to show how I do various parts of the model. In this tutorial, I’m focusing on the main color of the fort, or the “armor” color as I like to call it. 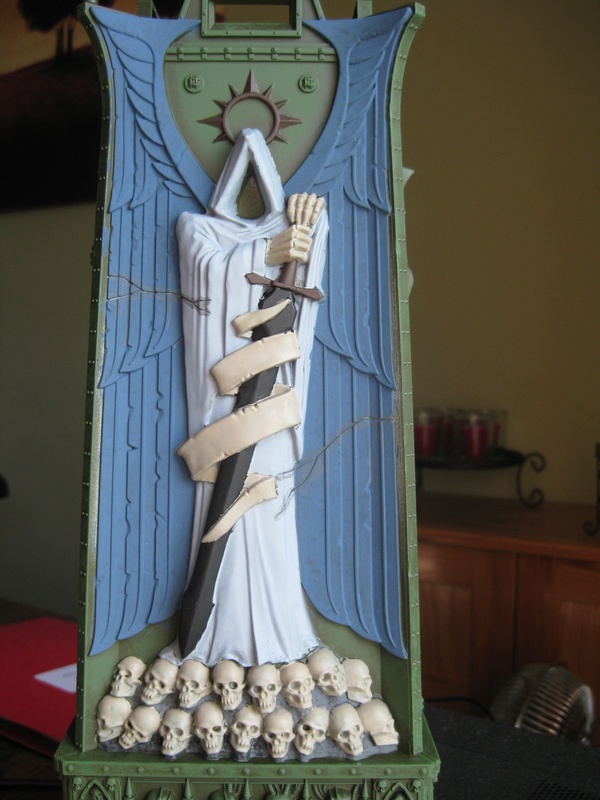 After building was completed I primed the whole model using Floquil Light Gray Figure-Primer. I like this for a few reasons. For one, it’s an actual primer so it will adhere to plastic, metal, and resign while giving a very strong and smooth surface for paint to work on. It covers so much better than any primer GW has put out. A single 3 oz can can prime this whole model. I base coated the whole model using Testors’ Model Master Custom Spray Enamel Dark Green. This would be equivalent to spraying the whole thing with Catachan Green. Since I don’t ever plan to strip this model and I didn’t use any brushes or an airbrush, I don’t really care that it’s an enamel paint. I dry brushed Anita’s Craft Paint Foliage across the entire model. You can achieve the same color using Games-Workshop’s Camo Green. Dry brushing is probably not an accurate term for what you do. I load up a large brush and wipe off most of the paint, but I then press and swirl the brush. The goal of this stage is to not necessarily get the raised edges, but also tinge the model a lighter green while allowing the base color to show through. Streaks and splotches will probably still appear where ever you begin. That’s why I would do a quick dry brush across raised areas. The paint will also appear extremely bright when you begin, but will dull and darken as it dries. I’m not too concerned about the streaks that visible as I will be painting all the details and wings different colors. If streaking is a problem or bothers you, then you can always go over the area with Catachan Green or Vallejo’s Olive Grey. I chose to go with the military green scheme as opposed to the brushed metal look that appears on the box because I want all my military buildings to be uniform. 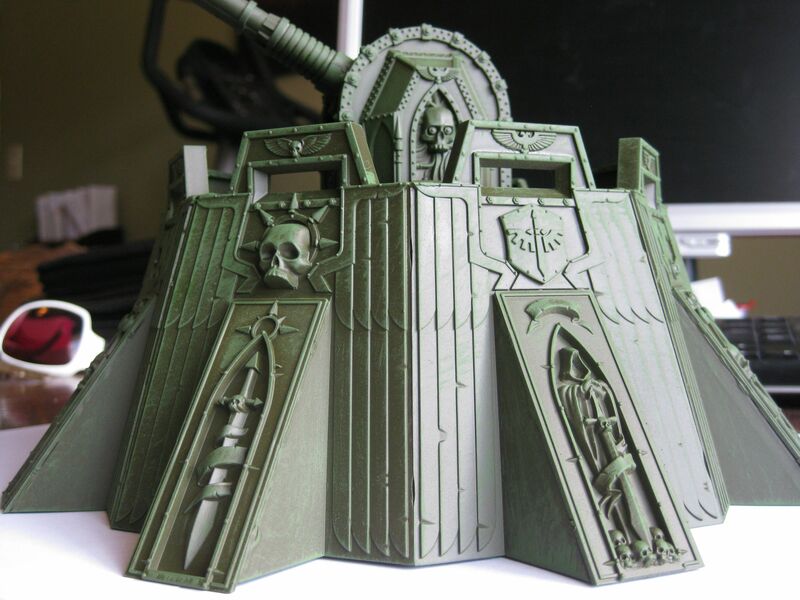 Since I plan on painting an Imperial Bastion and Sky Shield in a similar scheme, I want my fortress to tie into that theme. I will follow-up with another project update and tutorial as I move on to other sections. The next section will be the floor and tower, so check back. If you have any questions or criticism, let me know in the comments.